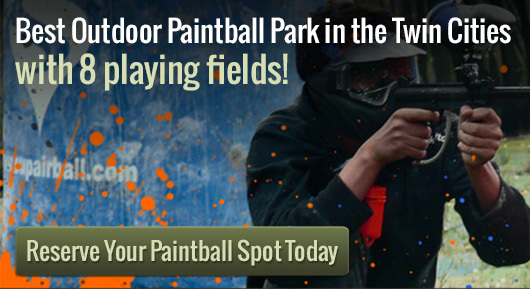 Are you looking for the best paintball places in the Twin Cities? Then look no further than Action Packed Paintball Games. When you go to this premiere outdoor paintball park, you will get the opportunity to have a great time with friends or on your own. Action Packed Paintball Games offers walk-on games or a reservation can be made for large groups or private play. The staff is experienced in paintball and is extremely friendly. We also offer compressed air and CO2 fills, ensuring that you are ready to play. All of these are reasons that this park is one of the best paintball places. Paintball is a great game to play with your friends or by yourself. You can head out to this park with a group of your friends and have the time of your life hanging out, having fun, and making memories together. You could also go out on your own for walk-on play. This is a great way to meet new people that enjoy the same past time fun that you do. You can easily reserve your spot to play by calling Action Packed Paintball Games at 952-492-6776. In order to make a reservation, you must have eight players or more within the party. If you have a preference in the playing field that you would like to use, you should ensure inform them when you make your reservation. If you are looking for the best paintball places, then Action Packed Paintball Games is the place to go.